Hello friends! I don't have much to post today- sun has been spotty and with all the Colors by Llarowe round-up posts I have done recently I actually have already posted most of my recent manis - odd! I know I probably have post-worthy pictures tucked away somewhere on my computer, but ever since I got my new computer (which was all the way back in October, alas) my file organization has been a little jumbled - maybe someday I'll find the inspiration to straighten it out. But I have had fun posting daily the past few days, and I don't really want to break my streak! So while it's not much, enjoy a couple comparisons I did recently, as well as a mani I did with the ...comparees. 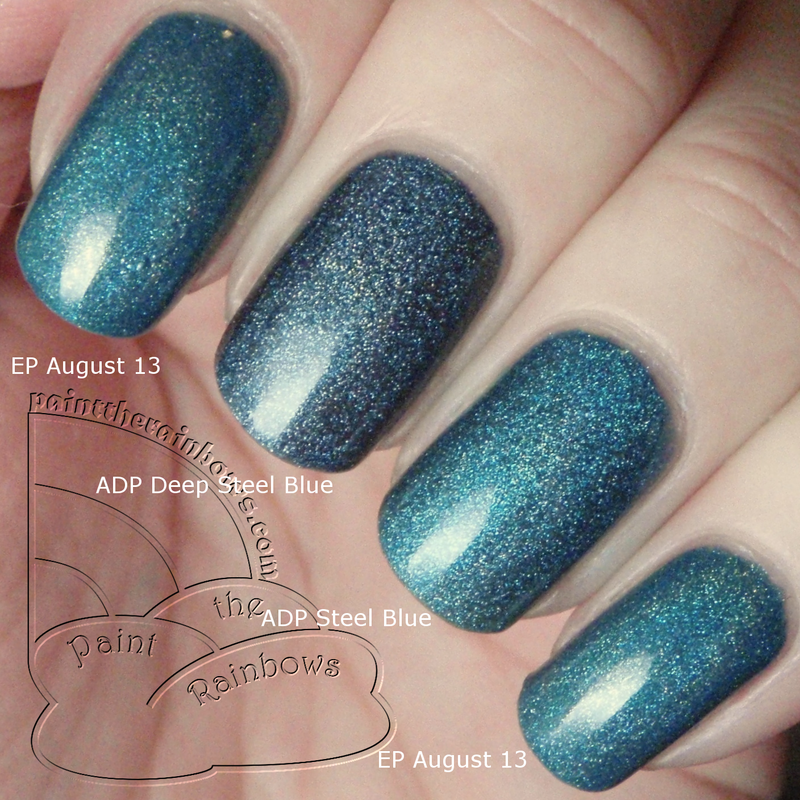 Aly's Dream Polish Deep Steel Blue is a dark, navy-ish teal with a strong scatter holo effect. By comparison, Steel Blue is more of a sky blue-leaning teal, with that same strong holo effect. Application is great! A little sheer at the first coat but builds easily in three. Obviously here I did mostly Deep Steel Blue in an accent of Steel Blue with Deep Steel Blue polka dots. 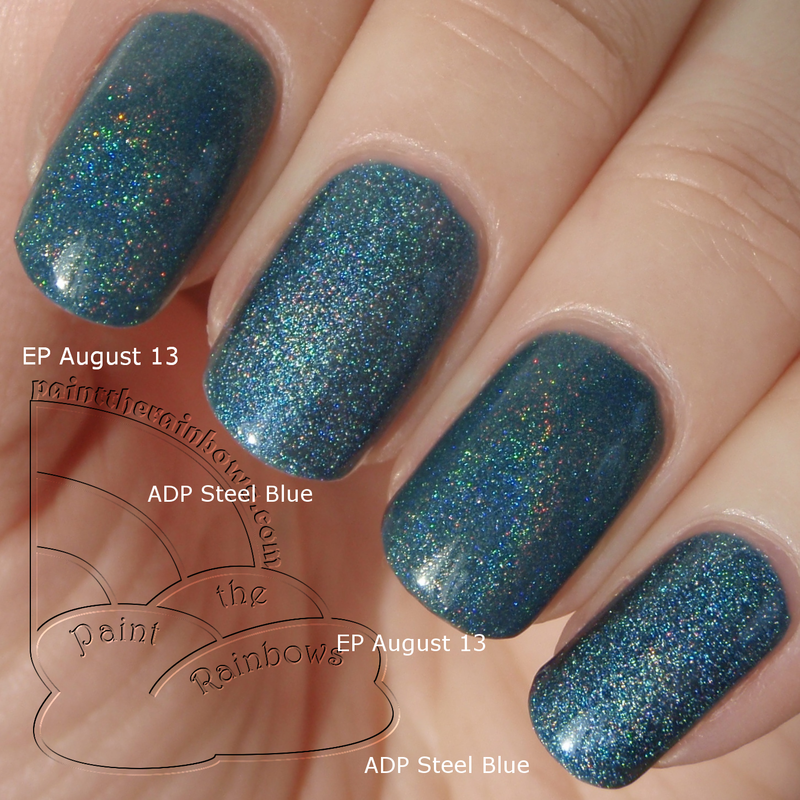 Someone in a nail polish comparison group I'm in on Facebook wanted to see the two pretties above compared with Enchanted Polish August 2013, which is also a blue-ish teal holo. It is most close to Steel Blue, but is a little darker, leans more green, and of course has a linear holo effect instead of scattered.